President Trump’s tweets suggesting forest mismanagement is to blame for California’s wildfire woes, and threatening to withhold federal funding, have prompted widespread rebukes for their insensitivity as thousands of citizens flee the fires – some, tragically, unsuccessfully – and as an affront to thousands of weary firefighters. Higher temperatures dry out vegetation and soil, creating more wildfire fuel. Climate change is shortening the California rainy season, thus extending the fire season. Climate change is also shifting the Santa Ana winds that fan particularly dangerous wildfires in Southern California. The warming atmosphere is slowing the jet stream, leading to more California heat waves and high-pressure ridges in the Pacific. Those ridges deflect from the state some storms that would otherwise bring much-needed moisture to slow the spread of fires. Global warming causes higher temperatures, and 2014 through 2018 have been California’s five hottest years on record. This pattern leads to an increase in evapotranspiration – the combination of evaporation and transpiration transferring more moisture from land and water surfaces and plants to the atmosphere. Essentially, global warming causes plants and soil to dry out as the atmosphere holds more water vapor. If Northern California had received anywhere near the typical amount of autumn precipitation this year (around 4-5 in. of rain near #CampFire point of origin), explosive fire behavior & stunning tragedy in #Paradise would almost certainly not have occurred. With these hotter, drier conditions extending late into the year, wildfires have become larger, and they spread faster, cause more damage, and are more difficult to contain. In a 2006 paper published in Geophysical Research letters, Berkeley scientists Norman Miller and Nicole Schlegel predicted that global warming would push the Southern California fire season associated with Santa Ana winds into the winter months. Those Santa Ana fires are especially costly because of the speed at which they spread due to the winds and because of their proximity to urban areas. The November 2018 Woolsey fire around Malibu and Thousand Oaks, California, is a tragic example. 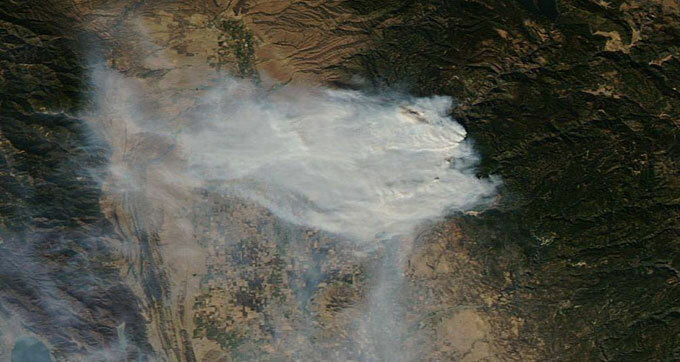 Researchers of a 2015 study published in Environmental Research Letters, led by Yufang Jin at UC Davis, forecast that the area burned by Southern California wildfires will increase by about 70 percent by mid-century as a result of the drier, hotter, windier conditions caused by global warming. And these Southern California wildfires often occur outside of forests, according to the president of the Pasadena Fire Association. Rutgers climate scientist Jennifer Francis over the past decade has been researching the connection between changes in the Arctic and extreme weather patterns throughout the Northern Hemisphere. In recent years a growing number of climate scientists have found evidence supporting her groundbreaking research. The Northern Hemisphere jet stream is a result of the temperature difference between the cold Arctic and warmer lower latitudes in regions like North America and Europe. But the Arctic is the fastest-warming region on Earth, largely because as reflective sea ice disappears, the Arctic surface is increasingly covered by dark oceans that absorb more sunlight. The rapidly-warming Arctic is shrinking the temperature difference between that region and the lower latitudes, which in turn weakens the jet stream. As a result, rather than a fast-moving flow of air, the jet stream increasingly is taking a slow, meandering path across the Northern Hemisphere. 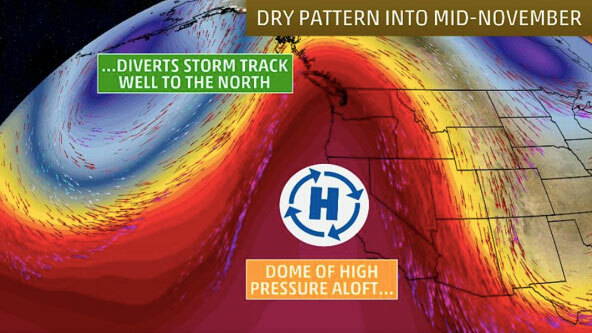 These high-pressure ridges divert storm systems around California, leading to the lack of rainfall in the state during these dry spells. In a 2017 paper in Nature Communications, researchers led by Ivana Cvijanovic and Ben Santer found still more evidence of a connection between disappearing Arctic sea ice and these high-pressure ridges in the Pacific. 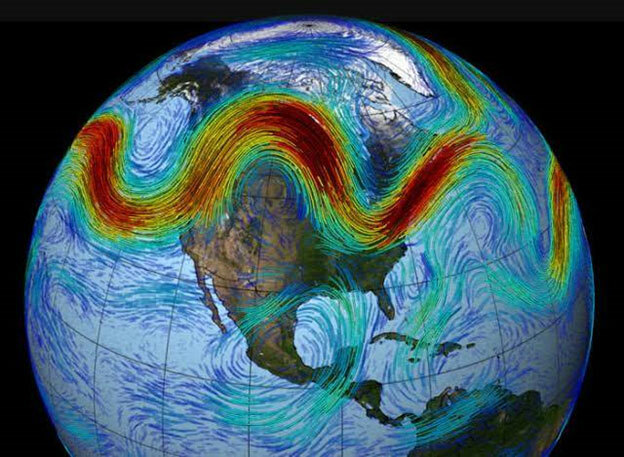 And in an October 2018 paper in Science Advances, scientists Michael Mann and Stefan Rahmstorf and colleagues found that depending on how human fossil fuel pollution changes in the coming years, the frequency of wavy jet stream events could triple by the end of the century. Climate scientists have identified numerous ways in which human-caused global warming is exacerbating California wildfires. A 2015 special report in the Bulletin of the American Meteorological Society found that “An increase in fire risk in California is attributable to human-induced climate change.” And a 2016 study in the Proceedings of the National Academy of Sciences found that human-caused global warming doubled the area burned by wildfires in the western U.S. over just the past 30 years. The reality is that the more global warming humanity causes, the worse California’s wildfires will become. Editor’s note: We welcome this article as the first of a monthly series of reports by new Yale Climate Connections regular contributor Dana Nuccitelli.